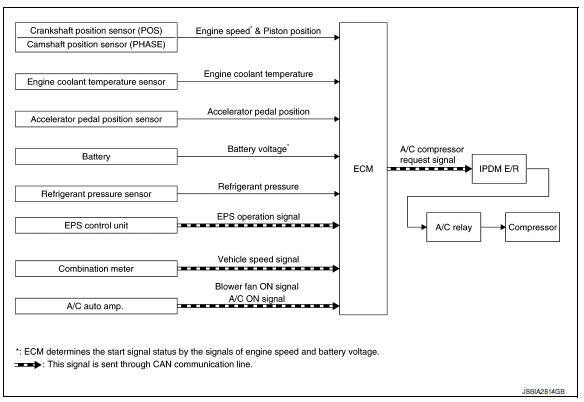 *: ECM determines the start signal status by the signals of engine speed and battery voltage. This system improves engine operation when the air conditioner is used. Under the following conditions, the air conditioner is turned off. When the accelerator pedal is fully depressed. When the engine coolant temperature becomes excessively high. When operating power steering during low engine speed or low vehicle speed. When engine speed is excessively low. When refrigerant pressure is excessively low or high.